Steve Mitchell kicked off his filmmaking career as the co-writer of the Jim Wynorski horror classic Chopping Mall (1986). He would later work on TV series’ G.I Joe, The Transformers and Pacific Blue. The idea for a documentary on legendary moviemaking maverick Larry Cohen came to Mitchell when was working for Image Entertainment – where he worked on DVD extras for various TV shows. 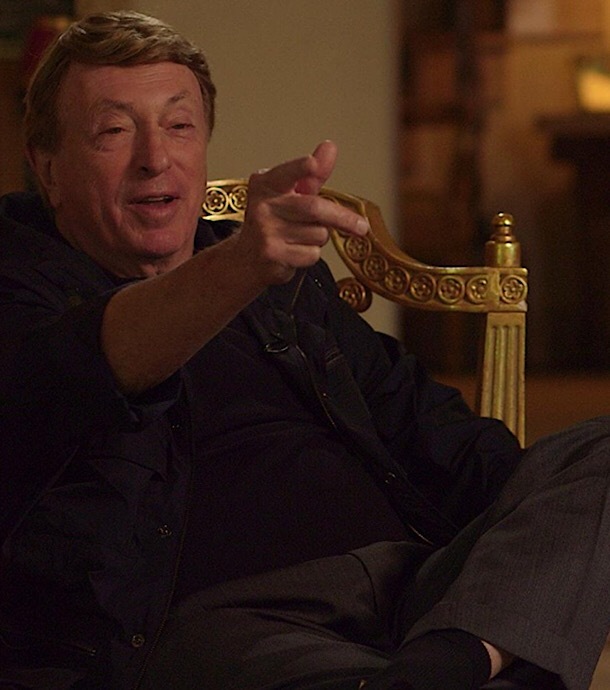 Upon looking at IMDB, Mitchell realized that Larry Cohen had been involved in so many projects he didn’t know about and went out looking for more and more info on the veteran filmmaker. The result? 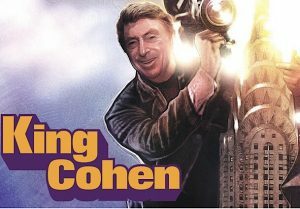 King Cohen, a documentary that features Cohen, and those who’ve admired him and his work including Martin Scorsese and Joe Dante, talking about his back-catalogue and how he changed the film industry as we know it. King Cohen releases in theaters throughout the US in July and Steve recently discussed the project via an exclusive interview. Meagan Meehan (MM) of Movie Vine: What inspired you to become a filmmaker, sir? Steve Mitchell (SM): Not sure if anything specific ever “inspired” me to become a film maker. I just loved movies…still do, and when I relocated to Los Angeles, I thought, like everyone else, why not at least try to get in the business? That said, I did go to film school back in my hometown of NYC, so it was, I guess, something that I was preparing for. SM: Well, my first “gig” was writing CHOPPING MALL with my old buddy, Jim Wynorski. We got a deal with Julie Corman, based on a beat outline we slapped together for a picture about teenagers being chased around and killed in a shopping mall. Vestron pictures wanted a “dead teenager movie, and if we came up with something they liked we had a go picture. Our first pass was with a phantom of the mall type killer, then Jim had the wacky and inspired idea about doing the movie with killer robots, or “Killbots” as we originally called them. Vestron liked the idea and we wrote it together – at Roger Corman’s office – then made the film. It was an amazing experience literally creating the movie on paper, then making the film. I always look at CHOPPING MALL as my graduate school project. SM: It was for shooting second unit on CHOPPING MALL, I think, and no, I didn’t frame it. I should have framed a copy of the check, because, well, once I cashed it, the check went back to the Cormans. SM: These days, I use HD cameras like everyone else. On KING COHEN, we shot most of the interviews, and “B” roll with, I think, Sony cameras, although I shot some material with my smart phone. All my non – fiction work has been shot with video or HD cameras. On CHOPPING MALL, and my other second unit work I shot in 35mm, which was very cool. I even used an old school Hollywood MITCHELL camera on occasion for Corman. Thing was as big as a Buick, and almost as heavy! SM: Good question. Not sure I know the answer. Making films, or docs, is actually my second career. Originally, I worked in the comic book business. I worked on staff at DC in my early days, then, eventually, went freelance as an inker. I put in a lot of time behind the drawing board over the years. I also did film journalism, almost as a hobby, during my comics career, which was great prep for what I do now. But, to answer your question, maybe I would teach film history. Lately I have been doing quite a few commentary tracks for films on Blu Ray. It seems I have soaked up an awful lot of knowledge over the years as a consumer, and fan. I hope I don’t have to think about doing something else, because I really enjoy the work I’m doing at the moment. MM: How did the idea of doing a movie on Larry Cohen come to you? SM: I was looking to do a feature: plain and simple. I was working at IMAGE ENTERTAINMENT…probably working on the DVD extras for the old TV series, COMBAT, and I was checking something out on the IMDB about Larry Cohen and was impressed by the amount of projects I did NOT know about! His over – all career really impressed me. So many scripts and projects were unknown to me, and I considered myself a fan. After that I had the notion that maybe Larry deserved some time in the spotlight, and a film about his career. I thought it might make a good project for me to do since I was a fan of his films. MM: Was Larry onboard with the idea? SM: Eventually we met, and I pitched the idea to him. He was flattered and told me he would help me any way he could with the project, which he did. He also gave me access to his archives, which was invaluable. Thanks, Larry! MM: Anything Larry insisted on not talking about or was he an open book? SM: Larry is very much an open book. He is quite the raconteur, and frankly, loves to talk about his work, and career… which made my job easy and hard at the same time. I have hours of interview material, which I could not use! Good stuff, too. I plan to organize it and include a bunch of it on the Blu Ray release. MM: Was it relatively easy to entice the big-name directors to participate? SM: “Relatively” is a pretty good word. Most of his colleagues like Larry, and his pictures or TV work. Tough part was scheduling the interviews when they were available. It takes a long time to cobble together all the parts needed to tell a compelling story. MM: What did you learn about Larry during the making of the movie? SM: He is a relentless creative force, who believes in himself and his work. My nickname for him is “the energizer bunny.” He just keeps going and going… there is no stopping Larry when he believes in a project. SM: For me, the best part is the work itself. The second-best part is that you meet all kinds of interesting people, and have memorable experiences working with them. Oh yeah, there is nothing in the world that is better than being on a film set, even a low budget one. SM: I kind of answered this question, but with any luck I will still be making films. Fiction or non-fiction. Doesn’t matter, because they are both forms of storytelling, which I enjoy doing. MM: Do you have any upcoming projects, besides King Cohen, that you would like to mention? SM: I have around a dozen doc ideas, a couple of TV series ideas, and I have a half dozen scripts I have written, that I think would make good movies. I’m going to leave it at that. If I’m lucky, I might get to make some of them, which would be a good thing. SM: Don’t. Unless there is absolutely nothing else you can do with your life. The biz really needs to be in your DNA. It is a tough business, tougher now than ever. But, advice wise…cozy up to people that have money to invest. Money still makes the world go ‘round, in this biz and getting financing is frankly the biggest hill any filmmaker will climb. Making a movie is actually easy by comparison. To learn more, visit his official Twitter, Facebook, IMDb, and website. Comments for “King Cohen”: Interview with Director Steve Mitchell are now closed.